Estate planning is a core responsibility of adulthood, regardless of your age. Even if you are a relatively young adult, you never know what the future holds. It is important to take the right steps to provide for the people that you love if the unthinkable was to take place. This is a universally applicable truth, but the stakes are even higher if you are a parent with dependent children. Each case is unique, and there is no one-size-fits-all estate plan. You should get personalized attention from a licensed estate planning attorney so that you can devise a custom crafted plan that ideally suit your needs. This exactly what you will receive if you decide to work with our firm. An asset transfer vehicle will be at the core of your estate plan. You may assume that a last will is the right choice if you are not very wealthy, and this document can suffice for some people. However, when you look into the facts, you will see that there are drawbacks and limitations that enter the picture if you choose to utilize a last will to state your final wishes in a legally binding manner. One major pitfall that goes along with the creation of a last will is the probate requirement. After the passing of the testator, a will must be admitted to probate. The executor or personal representative would handle the estate administration tasks, and supervision would be provided by the court. This process provides certain protections for creditors, but it is not necessarily wholly positive for rightful inheritors that are named in the last will. A major negative is the time consumption. When you are planning your estate, you probably would like to facilitate timely asset transfers to your family members. Unfortunately, probate will take nine months to a year, even if there are no significant complications. No inheritances can be distributed until the estate has been probated and closed by the court. In addition to the above, there is the matter of inheritance erosion. There are many expenses that present themselves during the probate process, including court costs, legal fees, accounting expenses, appraisal and liquidation charges, and other incidentals. All this can add up to noticeably reduce the value of the estate before it is passed along to the heirs. These are a couple of the major drawbacks, but there are others. Fortunately, there is a very effective way to transfer assets outside of the probate process. A revocable living trust can be utilized to facilitate timely, cost-effective asset transfers to the beneficiaries, and probate would not be a factor. This is one option that is ideal for many people, but there are different types of trusts that can be established to address advanced estate planning concerns. Every well-constructed estate plan should address the possibility of latter-life incapacity. You can include a living will to state your wishes regarding the utilization of life-sustaining measures. With a durable power of attorney for health care, you can name someone to make other medical decisions on your behalf if you become unable to make them yourself. A durable financial power of attorney could be added to empower a person of your choosing to handle your financial affairs. 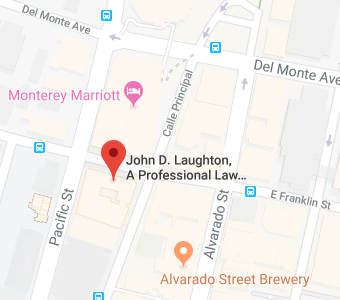 Contact Attorney John D. Laughton Today! If you do not have an estate plan in place, or if your existing plan has been neglected for decades, now is the time for action. To schedule a consultation, call us at 831-649-1122 or send us a message through our contact page.